Bluehost vs GoDaddy: Who’s the King of 2019? Most people know that Bluehost is a popular hosting company, but they typically don’t think of GoDaddy as a hosting company. When in fact, GoDaddy is actually the largest host of domains in the world as of this year! But—you probably already know this if you’re on this page comparing Bluehost vs GoDaddy! We created this comparison because we really didn’t feel that there were any good, honest comparisons of Bluehost and GoDaddy on the web. Most of them are slanted and sketchy, just trying to push you into buying one or the other in order to grab a quick affiliate commission. We hate that. So we thought—“why not create a good, useful page that helps honestly compare both hosts so people can really make a good decision?” And here it is! Alright—you came here for the comparison, right? Let’s get started! In order to fairly compare both hosts, we set up some objective testing, as well as our opinion (which is subjective, obviously). With testing, we really wanted to paint a complete picture of the strengths and weaknesses of each hosting company, and the best way to do this (in our opinion) is with web performance monitoring. There are a lot of companies out there that do web performance monitoring in different ways, but we felt that Dotcom-Monitor was the best choice for this testing because of the extreme amount of data they provide, and the different configuration options they have. In order to dive into any of the sections, you can click on one of the links above to jump down to that section, or you can simply keep reading! The gold standard in measuring a hosting company used to be “uptime,” which is essentially a word to describe how much reliable the servers are and how consistently they stay online vs offline. The industry standard in web hosting is typically 99.9% uptime, which means that 99.9% of the time, the servers will be online and accessible, and .01% of the time, they may be down. Things have shifted a bit in more recent times to focusing on web performance and support as two of the biggest factors that illustrate the quality of a web hosting company, but uptime is still relevant to a degree. It’s a big indicator of a host that doesn’t have their stuff together, as with modern infrastructure, it shouldn’t be hard for a reasonably-good hosting company to his those metrics. In order to set up a fair test, we took two websites and installed WordPress on them with similar configurations—one on Bluehost and one on GoDaddy. We then monitored these sites using Dotcom Monitor for 6 months straight at 5-minute intervals. This means that every 5-minutes, Dotcom-Monitor’s test servers would visit our websites, load the pages, and record data about the testing session. As you can see above, GoDaddy had an uptime rating of 98.11% and Bluehost had an uptime rating of 99.89%. While both technically fell below the 99.9% industry mark, Bluehost was almost there and GoDaddy was over a full percentage point below. Unfortunately this mirrors what our subjective experience has been with GoDaddy too. The seem (from our perspective) to be a lot more focused on their core business, which is domain names, than web hosting. Honestly, their web hosting just feels slow, buggy, and like something that was cobbled together—and this is reflected in their uptime numbers. With Bluehost, it’s a totally different story. Their hosting feels snappy, quick, and like a premium host should feel—and this is reflected in their uptime percentage which was essentially at the industry standard rate. So, the winner in this category is definitely Bluehost! As mentioned above, web performance is really a better metric to evaluate the quality of a web host than uptime nowadays. Why is this? Well, mainly because uptime used to be something to advertise but technology has gotten so good over time that it’s pretty much an expectation that uptime will be 99.9% or better and most legitimate hosting companies have enough redundancies in place where meeting this number isn’t a problem. With web performance, this isn’t the case as it’s just been in the past few years that people have really started to care about it. Even search engines now penalize slow-loading websites. So, what is the benchmark? 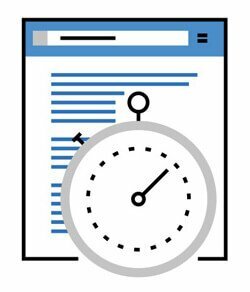 What is considered a “fast page load time?” Right now, it’s about 3 seconds or less, and this could change in the future too. And anything under 2 seconds is considered pretty blazing fast. Let’s take a look at how Bluehost and GoDaddy matched up in this head-to-head comparison of web performance. Looking at a the chart above, you can see that that Bluehost outperformed GoDaddy in every single category, except slowest server response time, which they tied. And to be fair, the fastest server response time column was only .02 different among each host. With that said, Bluehost was the clear winner in this category and we would absolutely recommend them over GoDaddy. “How much is a Bluehost or GoDaddy going to cost me, and which one is the best value?” That’s probably something that’s run through your head at least once while on this page, and we’re going to answer that question! First of all, GoDaddy web hosting can be had for as little as $2.49/month when purchasing through our link, and Bluehost is about $2.95/month when using our Bluehost coupon (which is really the best rate you’ll find for Bluehost anywhere on the web). So those are the two rates you have to look at—and it’s clear GoDaddy is the slightly cheaper option, but are they actually a better value? Honestly—no, they aren’t. Bluehost is a much better host in our opinion that offers far better support, a cleaner interface, and more reliable hosting (as shown by our tests above). In terms of the features they offer, it’s basically a wash—really. Both offer basically the same storage level, bandwidth, email accounts, domains (one is allowed to be hosted on the cheapest plan but not multiple sites), so there’s really no point in listing a comparison chart for this. Essentially, the pricing decision should be made on other more important features like support, web performance, etc., and on these—Bluehost really wins over GoDaddy. Bluehost Compared to GoDaddy: Which Is Easier to Use? A good web hosting company should be easy to use, and it should be easy to navigate their billing system and backend as well. Some hosts are terrible at this (like 1&1) where it’s nearly impossible to figure anything out or get around their system. That isn’t the case for Bluehost and GoDaddy, as they both have relatively good organization of their systems and backends. But—there’s one thing that separates Bluehost from GoDaddy in this area: GoDaddy always seems to be trying to upsell you on some product or service in their backend, and it gets really annoying. As you can see in the image above, it’s kind of obnoxious and honestly a bit intrusive. We get it—they’ve probably tested this and it increases their bottom like by always offers upsells. And they aren’t as bad as some companies (Network Solutions), but it just gets old after a while. Because most big name hosts use cPanel and are pretty easy to navigate, this is the deciding factor for us in this category. The upsells just shouldn’t be so prominent, so we’re giving the win to Bluehost. Bluehost Support vs GoDaddy Support: Who’s Got the Best Help? You’ve probably heard the phrase “good help is hard to find” before, right? Well, when it comes to the web hosting space, good support is really, really hard to find. Adequate support is pretty common, bad support is somewhat easy to find, but good, stellar support? That’s honestly hard to find. 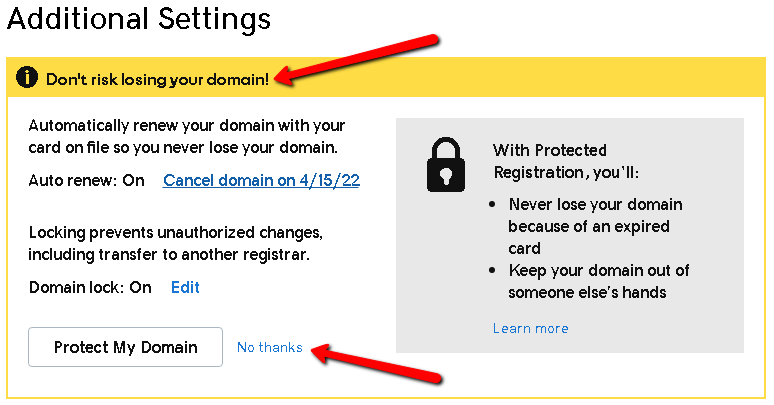 First of all, GoDaddy has stellar support for domain names. If you’ve got a domain name and need help, they’re awesome—but, they have different support teams for domain support and hosting support. And from our experience, the support is pretty terrible on the hosting side of things. The chat support is bad and the techs aren’t knowledgeable for many issues, and it’s just an overall bad experience. Bluehost is a different story—they have US-based 24/7/365 phone support, and that in and of itself makes a big difference. Their chat support is good (not great), but generally adequate, and their ticket support is about the same. Honestly, because GoDaddy’s hosting support is so terrible, Bluehost definitely wins out in this category. 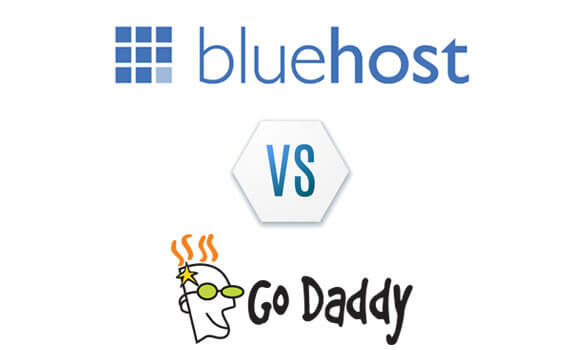 The Final Word: Who Wins the Entire Matchup – Bluehost or GoDaddy? We looked at a variety of factors, and went through performance, uptime, pricing, value, and more—but who actually wins this matchup? Uptime was a lock for Bluehost, as they were over a full percentage point higher than GoDaddy in uptime. That may not sound like a lot, but when you’re talking about website statistics, it definitely is. So Bluehost’s win in that category was a solid one. In terms of straight up web performance, Bluehost really took the cake there too, tying one category and winning all of the others. If you’re new to web performance or had never heard of it before this day—trust us, it’s a big deal. When it comes to value, ease-of-use, features & more, Bluehost came out on top here for a couple reasons, but mainly because they don’t try and upsell their customers in an annoying way on a bunch of garbage they may not need or already have. And pricing was a win for Bluehost because although they are slightly more expensive ($2.49/mo vs $2.95/mo), they definitely have enough things that are better (support, performance, etc.) at that price point to more than justify the extra $0.46 per month (which you could literally find in the couch cushions for a much better host, in our opinion). It’s pretty clear overall that when you’re looking at Bluehost vs GoDaddy, Bluehost is definitely the way to go in this matchup. And don’t forget—we have an exclusive Bluehost coupon code that offers an amazing discount that can’t be beat! When it comes to shared hosting and WordPress, here are the top 3 hosts we love!